Since my attempt at Sew Dolly Clackett, I have been meaning to make a "proper" version of the Elisalex, with its signature tulip skirt. I had the fabric all-along - a beautiful heavy cotton sateen from the home furnishing department of John Lewis. Not only it would make lovely curtains and blinds, I could see a floral Elisalex emerge before my eyes. 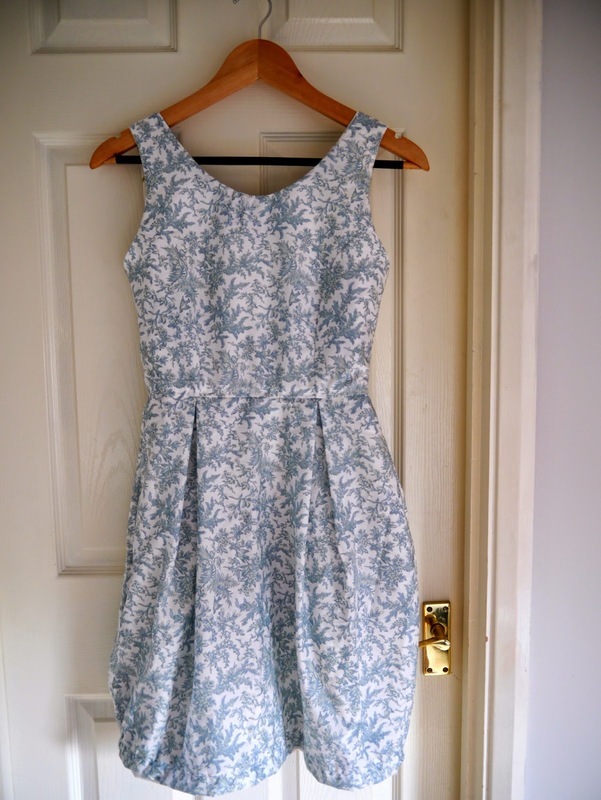 Wouldn't it make the perfect wedding guest dress? It's lucky then I still have 2 weddings to go to this year. And here it is, just as I envisaged. I pulled out all the stops with this one. I fully lined it with a lighter weight cotton lawn in a similar colour palette, with a cloth allowance built in (don't know what it is? Sherry explained it in detail here), finished and pressed the seams as I went along, and handpicked my zipper (after umming and arring about an exposed zipper). As much as I'd like to think that I pay great attention to detail for all of my projects, this one got just that little bit more attention. I must admit, I wasn't sure about the shape of this dress, and in particular, how the tulip skirt might look on my petite frame. But after seeing all those great versions on the blogsphere, I decided to give it a go. I knew, though, that the tulip skirt will need to fall just above my knees to even give me a chance of pulling it off. So after measuring the pattern, I hacked 10.5 inches off the length from the bottom of the skirt front and back pieces. I did contemplate shortening it from the hip area, but decided that the tulip would be even more profound, more likely to drawn my legs in it. I think it worked well. If anything, it probably could've done with shortening even more. The other alterations I made was to remove some back gaping issues, which were identified in the toile previously, and an SBA. 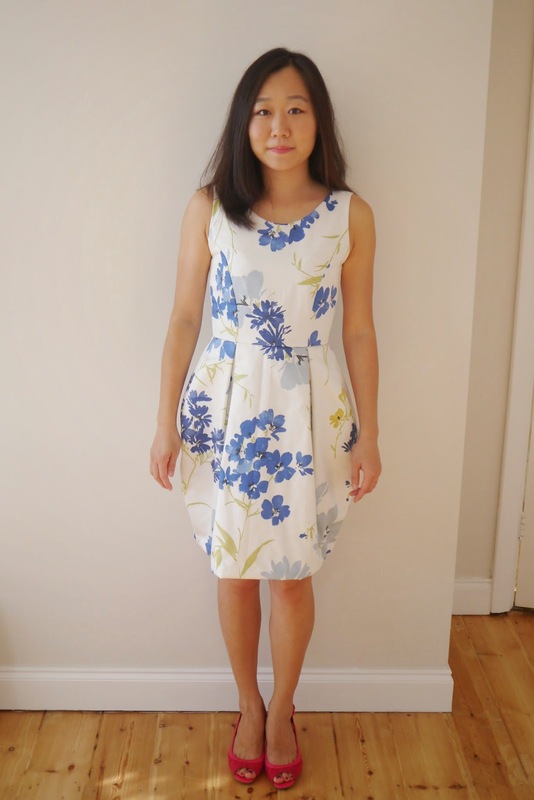 Have you seen the photos on the By Hand London website for this pattern? They are all fabulous, and more importantly the skirts all fall way above the knee. I know that I'm only 5'3'', but I could only imagine that Elisalex is a super tall lady with extremely long limbs in person. Now a few notes on the construction, and instructions. When I made this pattern (the bodice anyway) last time, I did not read the instructions, as I wasn't lining the bodice, or using the skirt, so it was really just a straightforward princess seamed bodice. But this time I paid more attention to the instructions. 1) For a smoother finish of the princess seams, staystitching and clipping on the side front seams would help achieve a more professional finish. I use this article here on threads. Can you see it? 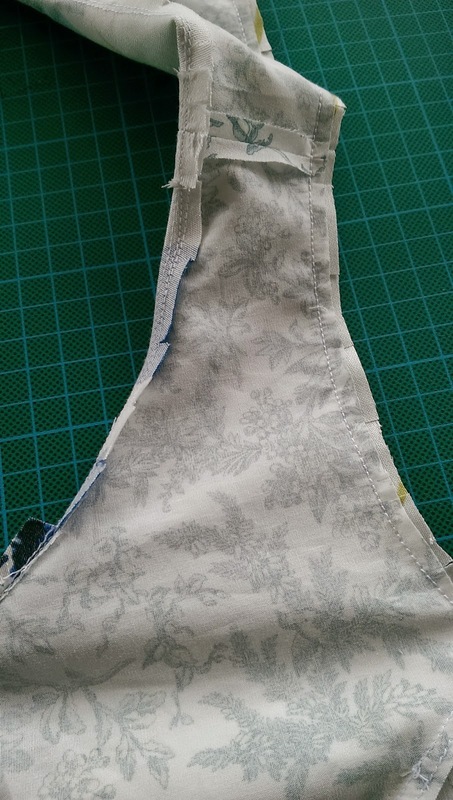 For both the fashion fabric and lining, I sewed a parallel line close to the seam in the seam allowance, before trimming the excess and pressing the seams towards the side. 3) After joining lining to bodice at the neckline and armholes, I think there's a crucial step missing -- grading, and understitching as far as you can. I referred back to my last (and only) fully lined dress before, my modest raspberry dress, and I looked at the instructions again (McCalls 5921) closely. 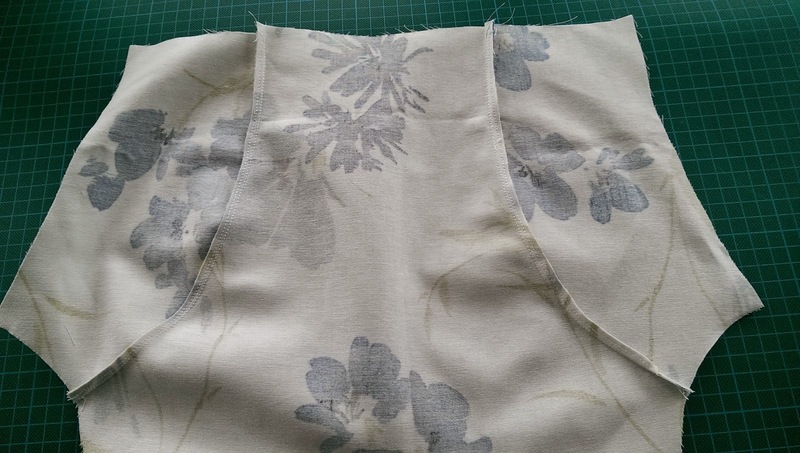 Grading and understitching in my opinion is the key to make the lining or facing lie flat inside the dress, without riding up to be on shown on the outside. Here's another in-progress photo before I pulled the lining out of each shoulders. Can you see that I've trimmed the lining at the armhole, and have graded, clipped and understitched the neckline? 4) Comparing to the detailed instructions on McCalls 5921, I was disappointed to find that for step 8, this pattern stated "this is a little fiddly and unfortunately impossible to clarify with a drawing so please read carefully", when I could clearly see a drawing done for the McCalls pattern. Other than the above, I do think that the pattern is well drafted, and overall the instructions are ok, albeit a little basic. It's lightheartedly written, with little tips for a couple of steps, and I liked that there's space for the notes to be made at the back of the instructions booklet. Although I don't think I am very much a By Hand London type of girl, I can see how this style could be appealing to a lot of people. I realise that I may have started off a bit negative about the instructions here (I'd like to think it's more constructive, as opposed to negative), so credit when it's due -- I would say that the somewhat basic instructions were made up by the detailed sew-along for this pattern. Although obviously I missed that by about a year and a half, a quick glance shows that it provided more details and pictures on the construction, as well as a platform for Q&As which is great. Anyhow, ignoring all that geeky talk, I am very happy with how this dress turned out - it's exactly as I envisaged when I purchased the pattern and fabric. I don't feel silly in the tulip skirt, and I would be very proud to wear this to the upcoming weddings! Well done with fitting this bodice Alice. I had problems getting it to fit as I wanted. I need to have another go at this. I love the fabric you have made it in. You look really lovely. Thank you Freya. I would say, don't be afraid to shorten the skirt, as it's clearly made for a giant! I was a bit worried about how much I chopped off at the bottom, but still think I could've cut off more! I plan on making this dress in a couple months for the first time and I'll definitely be coming back to this post for a reference. I really appreciate the constructive criticism that I haven't read elsewhere. This dress looks really really great on you, which gives me hope that I, also of very petite stature, may be able to pull it off. It's great to have so many petite ladies commenting :D We should have our own little club. It looks very elegant and classy and the inside lining is so pretty it deserves to be on the outside! Thank you Suzie! I really love the lining, too. It's a bit of a shame that it's hidden on the inside! but I'll know it's there, and it makes wearing it a lot more comfortable. I love this on you! It's gorgeous! Very pretty dress!! I'm also on the small side, so it's nice to know this pattern works on a short girl! Looks great! 30 minutes skirt - yes, really!